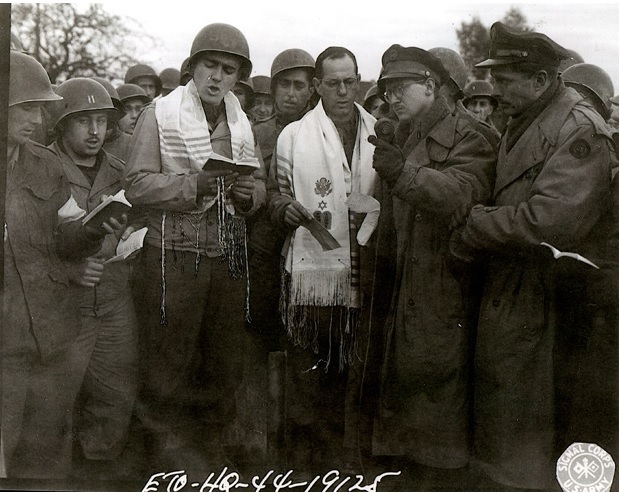 As Allied forces drove into Germany, among them was Chaplain Sidney Lefkowitz, Jewish chaplain. As Chaplain Lefkowitz made his approach to Germany, an NBC corespondent made contact with him wanting to broadcast his first service on German soil. This turned into quite an event with two other chaplains also speaking in solidarity and the service broadcast across the United States as well as being rebroadcast into Germany. PFC Max Fuchs, a soldier who had been studying to become a cantor before the war, volunteered to help with the service. NBC-AJC broadcast of the first Jewish religious service from Germany since the rise of Nazism. Third from left, Pfc. Max Fuchs who served as cantor; Chaplain Sidney Lefkowitz who led the service, with microphone NBC reporter James Cassidy, October 29, 1942.